According to the official website of Final, this movie is actually in theaters now – though I suspect it needs an updating. I have never heard of it, but I suppose it’s possible. 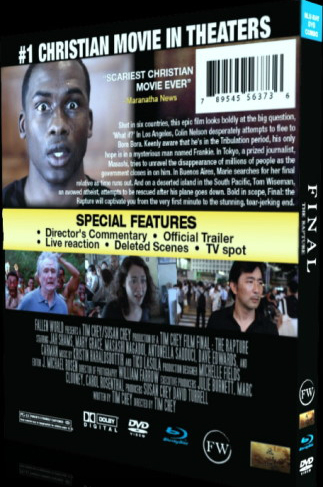 Filmed in seven countries, this is a Rapture movie that apparently spends a lot of time in Japan, where the filmmakers don’t seem to realize that the relatively small percentage of pre-tribulation Christians would make their disappearance almost unnoticed, if it happened. “An impassioned defense of God in a world gone mad,” says Variety, in a parallel dimension other than this one. Quit fighting, people. If you guys could’ve pooled your resources this might have been something.